Showing results for tags 'ken alexander'. On to the inside of the book! This is where we find the first and I'm going to go out on a limb and guess the worst case of editing in the book. The page numbers are wrong on the index page. I already knew about this extremely unprofessional editing error as I had read about it. the person who sent me the book had kindly written in the proper page numbers making looking things up much easier. The editor that Lori used is supposedly highly regarded and has edited some high profile books, so I'm not sure how something so basic got by him. Lori starts the book with a note to the readers where she explains what set her on the path from rebellious wife to transformed wife. If you have read Lori's blog for any length of time this story will not be new to you. However, you may notice that a few details she shared on her blog are missing. She tells us that "a few years ago" (12 by my count, Ken says 15 in his contribution at the end of the book) she and Ken were taking a walk and Ken essentially told her he didn't know what their future would look like once all the kids were out of the house. She notes they were very different from each other and the only things they had in common were the kids various sporting/dancing activities. This is why you shouldn't marry someone you are really in love (or even like) with just because you think they will keep you in the spoiled lifestyle you have led up to that point in your life. She doesn't go into the bits about not loving Ken and not having "butterflies" about anyone ever. She next tells us that problems started on their honeymoon when her adult husband dared to eat "fake cheese spread" on Ritz crackers. Oh, the humanity! Again how do you marry someone you know so little about? Is this the first time Ken has eaten in front of Lori or did he hide his dirty junk food love from her the whole time they were dating because he knew she was a "health nut?" She goes on to lament that her feelings of discontentment were due to the fact that she and Ken never connected in a meaningful way early on in their marriage. Perhaps because she didn't really love him, but saw him as a walking ATM? Thankfully, they had children and each baby gave her more excuses to ignore Ken. YAY! After Ken told her the awful truth about their marriage she thought back to other walks when Ken would tell her all the things she was doing wrong. She hated this because she felt like Ken was trying to "fix" her. On the previous page, she notes that few things were off limits when it came to her desire to "fix" Ken and make him into the husband she thought he should be. Self-awareness - Lori is doing it all kinds of wrong Then she found Created to be His Helpmeet by Debi Pearl. On her blog, she tells us that Debi spanked her and taught her what she was doing wrong. In the book, she uses the word mentored. She saw the error of her ways and became a transformed wife. This is why she decided to write her book to help those women that have tried counseling, reading books (the jokes just write themselves) and talking to other women. It seems to me she could have just recommended people read Debi's book and saved a lot of time, but that wouldn't get Lori the attention she craves. There is no going viral just recommending someone else's old book now is there? Next up: Lori's life story! I haven't read all the reviews of The Power of a Transformed Wife that are on amazon or elsewhere around the internet, but I want to be as complete as possible so before we really dig into the book, I thought I would take a moment to talk about the quality of the actual book. It has a glossy front and back outside cover with a "regular" paper feel on the backs of both covers. The copy of the book I have was used and had obviously been flipped through a number of times. The covers seemed a bit dingy to me, but it was hard to tell whether that was intended design or from the previous handling. The binding is very sturdy with no cracks, breaks or loose pages despite the handling. The pages are a nice quality, something a little better than regular copy paper. There were no smudges on the interior pages, despite the prior handling. I didn't try a highlighter but based on my previous experience, the book should take highlighter with no problems. The book has 240 pages (it's very repetitive and could probably be half that size with better editing). The back side of each chapter end page is covered in bits of the logo from the cover (see the cover image here). There are also various graphics at the top of each new chapter and used to delineate subject changes within chapters. there is also a tiny vine by each page number and a bible quote at the end of each chapter. The first thing that caught my attention was on the bottom of the front cover which says: It seems like a major branding mistake to send readers to a blog you are no longer updating, rather than your shiny new blog based on your book. I realize she wrote on Always Learning for years, but if you want to change your branding you should promote the new brand and link to the old one. The only URL on the book covers is to lorialexander.blogspot.com. 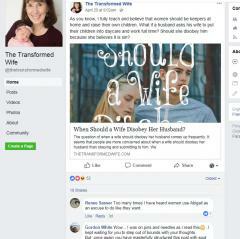 Once you get there, you are met with a post directing you to thetransformedwife.com. The URL on the book should be to thetransformedwife.com and once there a link to the old archived blog should be given. It looks unprofessional and is not a good way to build your new brand. I'm surprised her editor didn't offer some advice in this area. The back cover has the usual summary of what the book is about and the author bio. The bio says she "has a burden to teach and mentor women." I know using words that have a traditionally somewhat negative connotation in a positive way is a fundamentalist/evangelical thing (see: convict), but again this seems like an error if your goal is to grow your new brand. The bio also says her pots have been read by more than 5 million people, which I guess sound impressive until you do a little math. According to Lori, she has been blogging for a little over 6 years. We don't know if she is using unique visitors or page views, but most bloggers go with page views. Even if we go with unique visitors that is a little less than 1 million people per year. For comparison, we get between 4-5 million unique visitors a year and between 20-25 million page views a year. Perhaps it's not fair to compare Lori's blog to FJ. How about to Love, Honor, and Vacuum though? Here are what is available on Lori's blog from Alexa as of today (1.19.18) and here are LHV from Alexa as of today (1.19.18) Still not very impressive, IMO. Next time: We crack open the book!